We humans have some sort of primal urge to be the biggest and baddest thing around. There are many games that tap into this desire, but few do a better job than “snowball simulators” like Katamari and Agar.io. There’s a deep sense of satisfaction that comes from working your way up from a small blip to an enormous force to be reckoned with. It’s essentially the American Dream distilled to its most basic components! Donut County is another one of those. But, it’s not just another one of those. Donut County is a relaxing and brief experience whose charm and wit can afford a great time for people of all ages. What Donut County lacks in originality, it more than makes up for in creativity. All the gameplay consists of making things fall into a hole as it gets bigger with each swallowed object. It's something we’ve seen in plenty of games before, but each level introduces new ideas and concepts that can flip the moment to moment gameplay on its head. While it’s important not to get into specifics since so much of the fun lies in discovering what this game has in store yourself, rest assured knowing that it finds plenty of ways to keep the player guessing throughout the entirety of its three-hour runtime. It’s not long or complex, but there’s something inherently appealing about its simplicity and intelligibility. Donut County also tells an unconventional story that utilizes a unique sense of humor. You follow a raccoon with an insatiable desire for a quadcopter. You’re tasked with leveling this raccoon named BK up from level 9 to 10 on his donut delivery app, upon which he’ll finally unlock the coveted prize. Once again for the sake of spoilers, it’s important that more isn’t said, but it’s a surprisingly pertinent and thought-provoking tale. Donut County will also make you laugh, or, at the very least, exhale sharply through your nose. The writing is light on its feet and full of setups, payoffs, and one-offs. The Trashopedia in particular is a highlight. It’s a bestiary that has absolutely no function but is jam-packed with quips that are indicative of the game’s sense of humor. 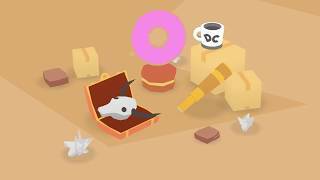 While Donut County can be very funny, satisfying, and relaxing, it may fail to compel challenge-seekers or players who prefer mechanical complexity. The game consists entirely of moving a hole in the ground and advancing dialogue in interstitial conversations. There isn’t much else to speak of. Most of the puzzles are solved quickly and easily. A few require more thought, but the cleverer puzzles that don’t make their solution immediately evident are easily solved by accident instead of being reasoned through. For each section that requires precise timing and navigation, there are ten others that simply involve swallowing all the small objects to get large enough to complete the level. While new twists on the formula are introduced, they are often repeated, which is unfortunate as the short runtime makes the reused puzzle mechanics stand out. 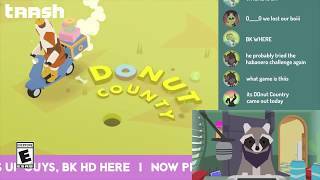 The creativity that’s on display in Donut County’s gameplay sequences is commendable. However, it’s easy to feel as if some variety and optional challenge are missing despite the adverse impact it might have had on the game’s accessibility. Donut County is a short and incredibly sweet experience. There isn’t much challenge and making a hole get bigger may not be as satisfying as accumulating a giant ball of junk, but it’s still a lot of fun to watch as an entire building falls into your perfectly-proportioned gap. The simple Unity-esque art style in addition to the accessible controls and premise mean that Donut County can be appreciated and enjoyed by pretty much anyone. Some may find the asking price a bit steep for such a short experience, especially considering the same game is less than half the price on mobile platforms. 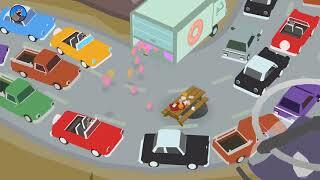 However, that doesn't keep Donut County from being delightful. If you’re content with an experience that can be picked up, finished, and put down in a single sitting with little to no adversity, then you’re bound to get plenty of enjoyment out of it. Playing through Donut County feels like sitting back and enjoying a brief moment of bliss, just like devouring your favorite donut. The simple art style and app-like interface go a long way in making a good-looking game out of surprisingly little. It uses good and consistent art direction to its advantage. Simplistic but satisfying. While it finds ways to keep you guessing, it isn't anything new at its core and there is no challenge to speak of. A witty sense of humor and quirky story do a good job of leading up to set pieces. The quick pace keeps you playing through each of the bite-sized levels. The simple Unity art style means that everything runs smoothly with no noticeable performance hiccups to speak of. It does a good job of making sure you can always progress, but lots of clipping happens courtesy of weird collision detection. Donut County is ranked #846 out of 1434 total reviewed games. It is ranked #62 out of 146 games reviewed in 2018.